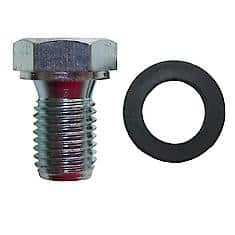 The oil pan drain plug is a small threaded bolt that is often made from aluminum. It has some seal gasket on it for tightening. When the car is new it does not require a lot of effort to open it but when the threads get destroyed it can give you many problems. The cause of many oil pan drain plug problems originates from the materials uses. Initially, manufacturers used steel, which is durable, but as demand rose they opted for soft metals like aluminum. Oil will start leaking whenever the gasket breaks or the bolt threads get destroyed. Engine oil is necessary to keep the moving car parts lubricated. When you start experiencing oil leaks a lot of friction is produced which later destroys various engine parts. There those who will opt to get a compression plug but this causes more problems by destroying your rubber gasket. This may work if you are experiencing serious leaks but it is only a temporary solution. If your car is coming up for service then it is recommended you have the plug replaced as you get your car serviced. 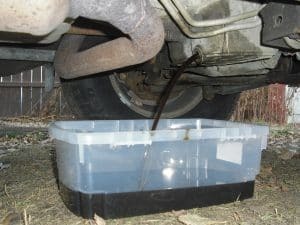 When changing the plug you will need to place a large container underneath the oil pan drain. This is due to the pressurized oil. Once it starts draining it will slow down. Try rotating the oil pan drain plug. If it bulges then you can continue with your oil drain. But, if the plug threads are damaged you will have difficulties rotating the plug. Apply more pressure to the plug and it will eventually come off. You can replace your existing oil pan drain plug with a copper one. When replacing the plug avoid over tightening it otherwise you will suffer from the same problems as before. You can do this if the original oil drain plug is not damaged and the gasket seems to be preventing any oil leaks. You can drill a new hole in the oil pan and install a new plug and gasket. To ensure that the old plug does not leak use a self-expanding rubberized oil plug. This should only be done if the oil pan is still new and does not show signs of tear. Installing a rubberized drain plug is a temporary solution and you should not let it run for long. Ensure you push it inside the oil pan so that it does not leak. To ensure that there are no leaks, run the engine at normal operating temperature and recheck the pan for any leaks. The helicoil is a sturdy steel thread that offers a permanent solution to your oil pan leaks. It helps repair damaged head bolt threads. One of the challenges of repairing the oil pan drain is that it can be costly and time-consuming replacing the entire oil pan drain. The TIME-SERT kit helps repair aluminium plug bolt threads with ease. It is cheaper and faster and you still get to retain your oil pan drain. Typically, expect to spend 30 minutes doing repairs with the kit. What is the size of wrench for oil drain plug repairs? A wrench is a handy tool for loosening and fastening bolts. You position the wrench on the bolt head and rotate in either a clockwise or anti-clockwise fashion. The wrench has a long handle where you apply torque depending on how tight the bolt is. In some instances, the wrench will come with a ratchet handle and this prevents you from having to lift up the tool every time. Each bolt is of a particular size and you need a corresponding wrench to get the job done. Sockets come in size ¼ inch, 3/8 inch, ½ inch and ¾ inch. The bolt heads can either be a hexagon (6 points), double square (8 points), and double hexagon (12 points). You should choose the right wrench to avoid damaging the bolt threads. When changing the draining the engine oil ensure that you first run the engine to operating temperature. This allows the oil to drain smoothly. Identify the right wrench – mostly 3/8 inch – and fit in the plug. Next, turn the wrench in a counterclockwise way. The oil will drain perfectly. How often should one drain their oil? This often depends on your car and how often you use it. You will often find service instructions in the car manual but it is recommended that you do it every 7,500 miles or once a year. You should not attempt to drive your car with the same oil for more than 10,000 miles without a change. This may cause irreparable damage to the gasket and seals while causing your car engine to overheat. Having stripped oil pan drain plug has been on the rise due to the replacement of the steel oil pan with an aluminum one. That is why you do not find the problem in cars manufactured before 2000. Aluminum has its advantages. For one, it is lighter than steel and this makes removes a few pounds from your car weight. It is also a better heat conductor than steel and this means it keeps your engine cooler while it is in the drain pan. But the problems with aluminum arise due to the increase in damaged bolt threads as people apply more torque when opening the bolts. A leaking oil drain plug should never be ignored as it can lead to the engine overheating and subsequently destroying the gasket and seals. If the threads are completely damaged it could mean replacing the oil pan which is expensive. If you are traveling and notice the problem you can use rubber plugs but they act only as a temporary solution. Other options include replacing your existing plug with a Helicoil or TIME-SERT seal. If your oil pan is still new but cannot open the oil drain plug seal, you can drill a hole on the side of the pan and add an additional plug. Ensure that there are no visible leaks before driving.